25 years ago from 2012. 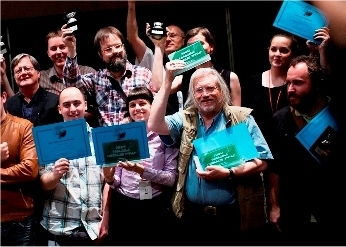 Eurocon Award wins at Zagreb. 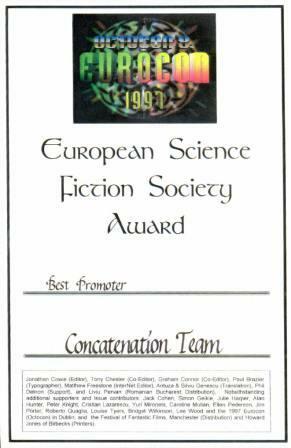 This is a BIG thank you to the various national representatives of the European SF Society (ESFS) for voting the Science Fact & Science Fiction Concatenation a Eurocon Award for 'Best Website' at the 35th* European SF Convention (Eurocon) 'Kontakt' in Zagreb, Croatia, in 2012. Sorry that none of the core team were there, but this is truly an honour hence our citing our appreciation here. The value of a Eurocon Award is, of course, that it signals to the broader international SF community European authors, publications, ventures and personalities of likely Science Fictional (SFnal) interest. So for non-Europeans who may be reading this then do check out the ESFS website for previous Eurocon Award winners: there is a lot of SF activity going on in Europe. Indeed, as this is our fourth Eurocon Award (5th if you count the special citation by ESFS for Essential Science Fiction: A Concise Guide), it is just vaguely possible that we might be doing something right. Who knows? First, unlike other SF awards such as the Hugo, with Eurocon Awards it is only possible to win an award in an individual award category once. (Stop Press: This was true up to 2012 prior to an ESFS constitution change.) This means that to win more than one Eurocon Award one has to do it in a number of award categories. Second, this year is the first year that ESFS have presented the new Eurocon Award category of 'Best Website' (hence our eligibility) and it is something of an honour to be recognised in the first of what will no doubt be a lengthy run of this category's awards in coming years. Third, apart from the 1997 Award for 'Best Promoter' (Dublin, Ireland), all our other Eurocon Awards have been voted for us at Eurocons outside of the British Isles: 1994 'Best Fanzine' (Timisoara, Romania) (back when we were a print publication) and 2004'Honorary Award' (Plovdiv, Bulgaria). So Croatia (2012), being another mainland continental European win, is a welcome continuation of this trend of being favoured away from our home turf. Eurocon Award for 'Best Promoter' of European SF. 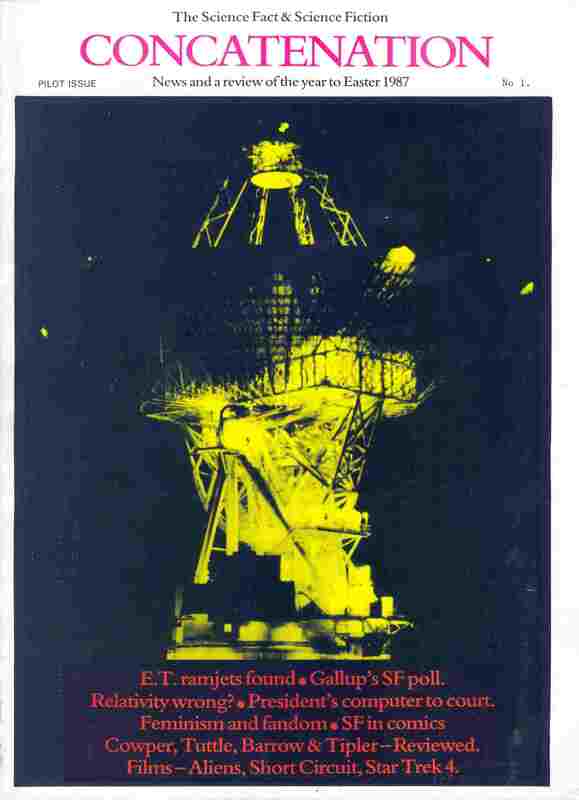 Fifth , this year (2012) sees SF2 Concatenation's 25th anniversary of our 1987 launch: it barely seems like yesterday, even though looking back we seem to have done quite a bit. Further, with anniversaries in mind, 'Kontakt' Croatia in 2012 is both ESFS's 35th Eurocon* and the 40th anniversary of the first Eurocon in Trieste, Italy (1972). In short, being given an award this particular year sort of resonates. *Zagreb 2012 was the 35th Eurocon if the Riga convention, that was voted for by ESFS and due to be held in 1985 (former USSR, now Latvia) but cancelled, is included. Some Eurocon lists omit this convention. For a brief introduction to the site click here.